The Abbey-Principality has recently received unsolicited communications from these individuals, acting under the name of the above corporation. In this response, we seek to make clear that we condemn these actions in the strongest terms and further that we believe that they constitute an ongoing campaign of harassment against us. The Abbey-Principality will not hesitate to defend itself against such attacks. The behaviour of Mr Harradine and Mr Goff since this time has included acts of provocation and harassment towards the Abbey-Principality. On 3 February 2014, Mr Harradine sent an email to the office of our Royal Patron, H.M. the Omukama of Bunyoro-Kitara, in which he made reference to inaccurate and defamatory material which has been placed on the website Wikipedia either by him or by third parties with whom he makes common cause. The Abbey-Principality has responded in full to this material in an Official Statement here. Mr Harradine by means of his email message sought to exert influence upon our Royal Patron to end his Royal Patronage of our Orders based on this poorly-sourced material which had been selected purely as a means of attacking us. In the view of the Abbey-Principality, Mr Harradine thereby engaged in conduct that amounted to tortious interference in our treaty relationship with the Kingdom of Bunyoro-Kitara, and has thus laid himself open to action under law. Our Royal Patron has, to his great credit, ignored Mr Harradine’s illiterate communications (it is difficult to take seriously the “scholarship” of a man who cannot use an apostrophe correctly). Indeed, the Royal Bulletin “Royal Decisions” (https://abbeysanluigi.files.wordpress.com/2012/12/46-royal-bulletin-royal-decisions.pdf) makes it clear that H.M. the Omukama does not enact retroactive changes to his decisions on recognition and related matters. On 10 August 2014, the Abbey-Principality received an unsolicited email communication from Mr Harradine. Two days later, it received the same communication from Mr Goff. More recently, it has received the same communication anonymously via postal mail. The timing of these communications, being issued less than forty-eight hours after a notice had been published that the Prince-Abbot had suffered the loss of his father, is notable and cannot but reflect poorly on the character of those concerned. In their message, Mr Harradine and Mr Goff made it clear that the publication of our response to the original article that they had circulated was creating major problems for them. The communication threatened that if we did not remove our response, they would publish their original article on their website; an oddly hollow threat given that we have already addressed the matters concerned thoroughly in our response and thereby exposed those issues to the public for the past eighteen months. It is the policy of the Abbey-Principality that where threats are made to us, we will make the matter public and ensure that the perpetrators of such actions are exposed. We also note that the communication sent to us, which includes such sentences as “If you do not respond to us, we must consider that you want us the enclosed article onto the worldwide web” [sic] is illiterate even by a basic standard of English. The Abbey-Principality does not seek to suppress historical debate, and accepts fully that such debate may include such matters as the critical consideration of our history and our legal status, since these are matters of legitimate public interest. Research into our history is ongoing and has been highly productive in recent years, and it is our hope that further documents of a historical nature will eventually be made public should agreement be reached with their present owners that will allow us to do so. We have never claimed that our archives are complete, particularly regarding the earliest years of our existence. However, we have presented our history and tradition in good faith throughout and with ample reference to those historical sources both from within and outside our ranks that we have been able to make available on our website. Our history is only one aspect of our work, but it is one that we reflect on with a justifiable pride both in the accomplishments of our forebears and in the values that they supported and that we perpetuate today. Not for nothing have we merited the recognition of, among many others, the de jure Emperor Kyrill of Russia (Grand Cross of the Order of the Crown of Thorns) and the late King Peter II of Yugoslavia (High Protector and Grand Cross of the Order of the Crown of Thorns). For us, the 1962 Letters Patent of King Peter, in which he recognizes the Prince de San Luigi, constitute all the recognition that we might require, and render debate on our historical origins entirely moot. We therefore feel that it is entirely reasonable that we should require that debate on such matters should be undertaken in a balanced and respectful manner, and that it should not be conducted in such a manner as to attack and defame us. Mr Harradine and Mr Goff are clearly not interested in historical debate on these terms, as witness their obvious bias and their failure to confer with us or seek our response to their material in advance of its publication in their newsletter or on Wikipedia. They even contradict themselves: in a previous publication from 2010, their “commission” said of our Royal Patron, H.M. the Omukama of Bunyoro-Kitara, “King Solomon Iguru is a full “de jure” sovereign with all the rights, privileges and royal honours of such, because both he and his ancestors obeyed the international jurisprudence which preserves such rights in perpetuity.” The Abbey-Principality of San Luigi has been fully recognized by H.M. the Omukama as it was by his predecessor, as is the noble Bunyoro-Kitara title of Mukungu that has been held by the Prince-Abbots of San Luigi since 1885. Yet the “Commission” clearly does not accept the decisions of H.M. the Omukama as a sovereign to recognize the Abbey-Principality through formal treaty, confirmation of title and bestowal of his Royal Patronage; all actions that have been fully documented and made public via our website. A sovereign does not need to seek the permission of a self-appointed “commission” before he acts; his decisions are the law whether that “commission” likes them or not. It is quite clear that the intent of the “Commission”, whether in their own communications, or on “free-for-all” websites such as Wikipedia where such material is accepted anonymously and without question, is to attack us and indeed any other party who is perceived to threaten their commercial interests or their high opinion of themselves. The phrase “commercial interests” is used in a very specific context here. 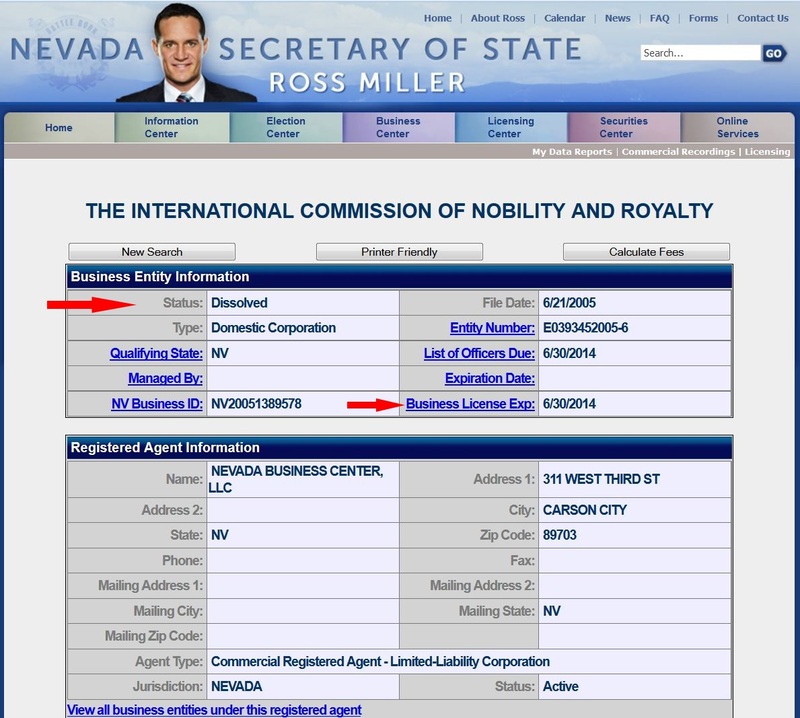 Reference to the website of the Secretary of State of the State of Nevada (http://is.gd/Li3Kk2; see screen capture above) shows that an entity called “The International Commission of Nobility and Royalty” was registered as a corporation in Nevada on 21 June 2005. This registration was as a for-profit domestic corporation. The reader may reflect on the credibility of an “international commission” that is structured as a profit-making commercial entity in a well-known corporate haven. The President, Director and Treasurer positions are all listed as the same individual, Donald Edward Goff, while the Secretary is Peter Harradine. It would appear that far from being “international” in its organization, this is in fact a two man outfit, both of whose principals are American citizens. Moreover, it is now a defunct outfit, for on 2 June 2014, its directors made application for its dissolution, that act becoming effective on 30 June. What purpose can its principals now have in writing to us and threatening action by a non-existent corporate body? The legal and financial structure employed by the Abbey-Principality is that of a charitable trust organized as a non-profit and tax exempt organization under English law. No individual can derive personal profit from its income, which is devoted entirely to meeting the running costs of the organization, supporting the practice of our religious beliefs and supporting the relief of poverty. The contrast with the position of the “Commission” will be noted. It is interesting that the website of the “Commission”, as downloaded on 23 August 2014, states that it is still an active corporation in Nevada. The same can be confirmed by reference to a capture of the site in the Internet Archive Wayback Machine as of 14 August 2014 (https://web.archive.org/web/20140814175159/http://www.nobility-royalty.com/id66.htm). A screen capture of the same page is reproduced below, with the capture date included in the URL. Reference to the Secretary of State’s website will show that this claim is false. If an organization cannot even be truthful about its corporate status, how much else about it can bear scrutiny? We note that the Statutes of the State of Nevada, specifically NRS 78.047, make it illegal to do business as a Nevada corporation without filing articles of incorporation. NRS 78.047(1). Every person, other than a corporation organized and existing pursuant to the laws of another state, territory, the District of Columbia, a possession of the United States or a foreign country, who is purporting to do business in this State as a corporation and who willfully fails or neglects to file with the Secretary of State articles of incorporation is subject to a fine of not less than $1,000 but not more than $10,000, to be recovered in a court of competent jurisdiction. Furthermore, NRS 78.585(1) provides that a corporation may not continue the business for which it was established after it has been dissolved. Any service contract or subscription service with such a corporation would also appear to be terminated by the act of corporate dissolution. A person engages in a “deceptive trade practice” if, in the course of his or her business or occupation, he or she: Knowingly makes a false representation as to the source, sponsorship, approval or certification of goods or services for sale or lease. A cursory search reveals some interesting information concerning Goff. A lengthy report has been commissioned from Oracle International, a Florida-based firm of private investigators, by Goff and this may be viewed on the internet at http://www.whereispdf.com/view/68861/contents/page_0001. The contents of this report show that Goff, in or around the year 2000, attempted to purchase via an Internet “title broker” for substantial sums of money the “feudal title of Prince of Halberstadt…from the Imperial and Royal House of Hohenzollern of Germany” as well as the title of “Knight Grand Collar” in the “Knights of Malta” and an unspecified dignity from the “Most Noble Patriarchal Order of St Mary of Palastine [sic]”. It is stated in the report that after subsequently reading an article on the Internet about the commercial brokerage of nobiliary and chivalric titles, Goff came to the conclusion that he had been deceived and defrauded. We cannot disagree with such a conclusion. The position of the Abbey-Principality, which has never engaged in the commercial brokerage of nobiliary or chivalric titles, and which has consistently advised any who may approach it to avoid those who claim to deal in such commodities, is that an individual who has previously attempted to purchase nobiliary and chivalric titles on the Internet is unlikely to be an unbiased arbiter on the legitimacy of such matters. While we sympathize with Goff’s unfortunate experience, this cannot serve as a justification for online vigilantism against parties that have nothing whatsoever in common with those who have defrauded him, and indeed which in our own case have good cause to regard themselves as adversely affected by the activities of the very same persons with whom he has had past contact. Indeed, the Abbey-Principality has been extremely critical in the past of individuals who have been engaged in schemes to persuade various regnant and ex-regnant Royal Houses to sell titles in return for financial commission and the bestowals of high titles of nobility and grades of knighthood upon themselves, and has openly stated that it regards those who engage in such practices as thoroughly disreputable. We have already commented on this with particular regard to Bunyoro-Kitara. We suspect that some of the individuals concerned are not unknown to the principals of the “Commission”. The same critical viewpoint pertains regarding for-profit entities, whether calling themselves “international commissions” or not, that have clear vested interests in matters of this kind that would immediately throw into the severest doubt any claim that was made as to their expertise. Expertise would certainly not appear to rest with those who have previously believed that the House of Hohenzollern and the Order of Malta would sell dignities via an internet title emporium. We are interested to note that the “International Commission on Nobility and Royalty” invites individuals to apply to it for “certification” of noble or royal status, or indeed of knighthood, which certification apparently necessitates annual renewal against a fee. It is not clear as to why the holder of a genuine title should feel the need to obtain a “certification” from an American for-profit corporation consisting of two named officers that lacks the slightest authority to certify anything. By contrast, holders of dubious honours are often eager to seek legitimation from any source. Cutting to the chase, the “Commission” has advertised that, “Members who contribute large sums of money will be given the designation of diplomates and fellows of the Commission–our highest non-royal, non-noble status if they contribute $2,500 or more. All contributing $5,000 or more will be given the status of high diplomates and fellows. To remain…only requires the yearly payment of continued membership fees.” This speaks eloquently for itself. The sale of titles is still the sale of titles, whether the transaction is for dukedoms or “high diplomates and fellows”. We are told, furthermore, that all “donations” for such services are non-refundable, and the website, which seems latterly to have been devoted in large part to the sale of books, also contains one of the lengthiest legal disclaimers that we have yet seen. Yet it appears that we need have no concern, for the “Commission” tells us “there is nothing sneaky in it”. In the course of this spiel, we are told that the “great cause” of the “Commission” is to “make the world safe for democracy” – a decidedly incongruous neoconservative stance for an organization that is supposedly monarchist in character, though not a great surprise for one that has been initiated by Americans. The acceptance of such a disclaimer is stated to be obligatory if one wishes to transact with this peculiar organization; the experienced reader will remember similar disclaimers and non-refundability of services as being a feature of most Internet title-sellers. 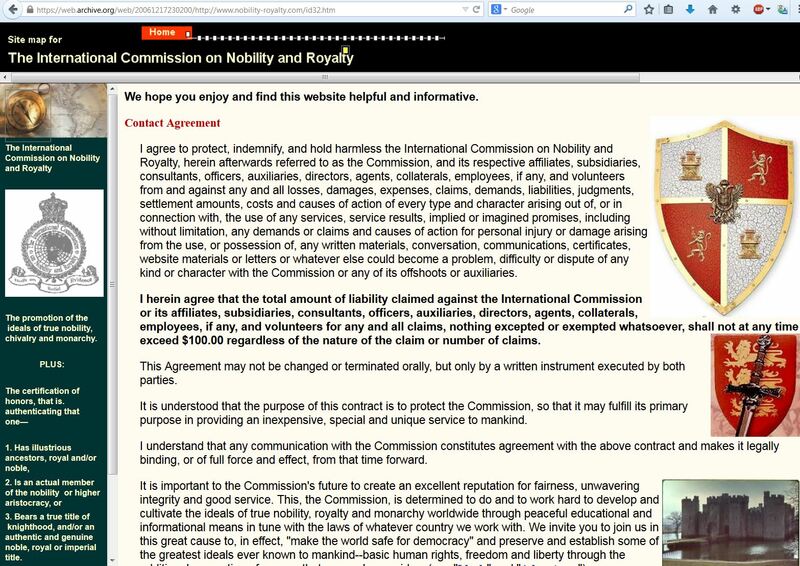 Another common feature that may be observed is the unauthorized use of a royal crown in the logo of the “Commission”, which, in contrast to the Abbey-Principality, enjoys no Royal Patronage, and the copious use of portraits of royalty, national and personal coats of arms and the insignia of chivalric orders throughout their website, none of which parties have in fact endorsed this for-profit corporation in any way whatsoever. Possibly our experience is salutory; it seems that if you do not pay up for the “recognition” of the “Commission” and submit to its judgements, its response will be to attack you. That sort of behaviour is both all too familiar and very far from “noble”. Indeed, one does not have to look far on the internet to find the “Commission” described openly by others as a scam (see, for example: http://is.gd/uTMVQt). We will report any further activity undertaken in the name of their dissolved corporation to the Nevada Attorney General for action, having already preserved dated screen captures of the relevant webpages for future use in this regard. A legally binding commitment from Mr Goff, Mr Harradine and any past or future organization in which they have a controlling interest to refrain from any such actions in the future.